Matt Hilton Thrills: More Pace Anyone? Anyone who has read any of my books or short stories – not half my Joe Hunter crime thriller series – they’ll probably guess that there’s a certain element that I attempt to inject in each and every tale. I’m not talking action, violence, blood or guts – even if there are ample portions of each to keep the hungriest reader sated – I’m talking about ‘pace’. Pace is what keeps the pages turning frantically into the night. Now, injecting pace isn’t simply a paring down of the words so that you race through the text much faster while reading, and it’s not simply about jumping from one set piece to another. Admittedly they’re both techniques that I do use, but there’s more to pace than simply abridging a longer book. First off, my hero narrates the story in first person past tense. In this way we are inside Joe Hunter’s head, and see things the way he sees the action. If anyone has ever told you a story, when events excite them they speed up, and so does Hunter in the narration. He get’s excitable and this translates to the reader’s ear and – hopefully they get excitable too. They experience the story through his senses, and hopefully feel some of the visceral kick and adrenalin buzz Hunter is experiencing. Sometimes I like to overlap chapters, seeing the events through different characters’ eyes, seeing their take on the same events. Sometimes Hunter’s voice isn’t the best to narrate the fear or terror of a victim, or the rage or smug satisfaction of a bad guy going in for the kill. But because we get the unfolding story from the other party, we are sometimes ahead of Hunter and forced to think ‘Oh, no, how are you going to handle this, Joe?’ It causes anticipation, ergo the desire to read on. Description is kept to a minimum. I like only to drip feed some facts and local colour into a scene and prefer that the reader conjure their own vision of the scene. Some people say I write very visually, or cinematically, but if you were to actually take a deeper look at my writing, you’ll probably realise that much of the picture has been formed in the reader’s own mind’s eye. Not mine. It’s a clever ploy, and not something I claim to fully understand, I just do it. I tend to keep chapters short (but not Patterson-short). I know from my own reading experience that I often flick forward a few pages in a book to check where the next chapter ends, perhaps looking for a natural break where I can stop, grab a coffee, go to the loo, eat something, or even go to sleep. Often if the natural break is only a short page or two away, I’ll subconsciously decide to wait for the next break, or the next, and so on. The book therefore unfolds quickly, and it might seem with no thought in the reader’s mind of ‘Hell, I’m never going to get through this’. I like to leave a cliffhanger at the end of many chapters. Because the story is often told chapter about, Hunter taking the lead, followed by a third party character – often the villain – the reader is urged not only to read one chapter to find out what happens next, but two, and so on. Usually there’s a problem that becomes apparent. It is usually followed by an attempt to rectify said problem that fails or the problem changes or grows larger. The third act is usually a fast-moving race to the finale as Hunter tries to save the day (whatever the problem may be). By having these three acts, the story is like three separate but interlinked narratives, all three leading to that final battle royal at the end. Because the stories are violent by nature, I like to show the action in a series of set pieces, each a stand-alone scene in itself, but each promising a bigger, faster and more exciting finale. 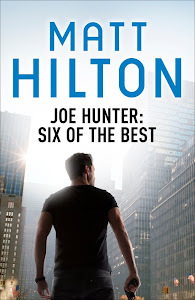 When you have big action scenes early on in a book, it seeds the idea in the reader’s mind that the end must be even bigger, and hopefully the hook that they want to find out how Hunter can surpass what he’s already dealt with keeps them turning pages. Hunter doesn’t say much. When he does it is short and to the point. The dialogue is often leavened with sporadic bursts of dark humour. A laugh can help the pace, because it helps put the reader’s mind in an alert state, and again keeps them moving on, AKA turning pages. Some people point at my writing output over the last three or four years, and think I’m incredibly gifted when it comes to speedwriting. That seems like a lofty claim, but I mention it only because I wish to get the point about pace across. I write fast because I’m feeling the pace myself. Because the writing style is fast, I seem to be able to put the words down on paper almost equally as quickly. I feel the buzz and the adrenalin rush. If pressed to answer where my need for pace comes from, it’s probably due to the kind of books I loved to read as I was emerging as a writer. I loved the old so-called ‘Men’s Action books’ of the 1970s and early 1980s, typified by Mack Bolan, Remo Williams, Nick Carter and the like. I also loved the 1930s action adventure tales that are best remembered for Robert E Howard’s Conan the Cimmerian, Edgar Rice Burroughs’s Tarzan etc. All those tales were fast moving, slightly larger than life and were – above all – great fun to kick back and read. It was due to those books that I began writing in earnest, as I tried to emulate my literary heroes. When I came up with the idea of the Hunter series it was with a mind to pay homage to those old action writers, and I hope that I’ve achieved my plan. Also, as an add on to that master plan, my mind has recently been wondering if there were other writers out there equally inspired by the same books as me, and I played around with the idea for some time of putting together a collection of action inspired tales. Well, that plan is now underway. I’m shortly going to release a collection of action-packed short stories, aptly under the banner of Action: Pulse Pounding Tales as an eBook, where the emphasis is on - you guessed it – action and pace. It seems that there are other writers who similarly enjoy a good old rippin’ yarn, with plenty of escapism and derring-do. It’s turning out to be quite a weighty tome, but one thing I can guarantee: it will be a helluva fast read. I too like stories that are fairly pacy too! I use most of the things you mention here... Great post, Mattt!